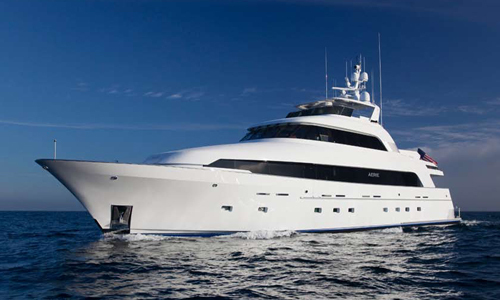 Luxury yacht AERIE is a 37,80m (124’) charter motor yacht which was built by Delta Marine in 2001 and was refitted in 2009. 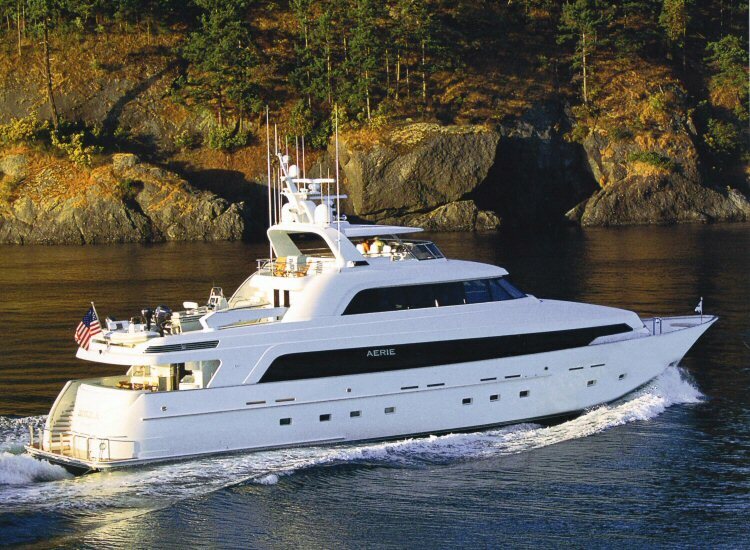 M/Y AERIE is available for luxury yacht charter vacations in the Bahamas and the Caribbean. 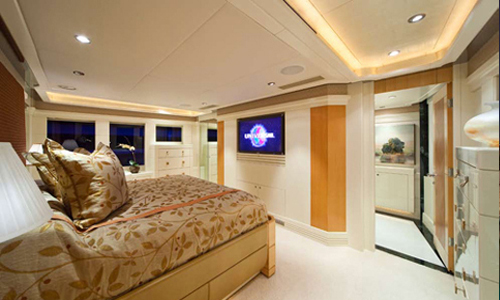 In 2009 the luxury yacht underwent a complete exterior paint and she upgraded the audio visual system, as well as Mediamax Network Library, ipod dock stations throughout the boat and Zero speed stabilizers. 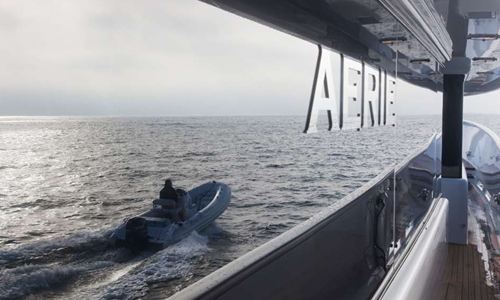 Superyacht ‘AERIE’, meaning eagle’s nest, is a lightweight, semi displacement, tri deck motor yacht with fluid design touches, technical innovation proven excellence in performance. 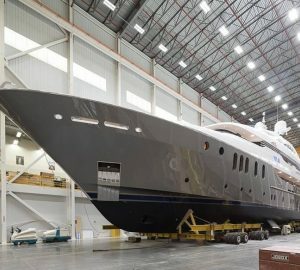 The yacht presents a graceful sculpted profile which is distinguished by an absence of visible hardware and the length of dark windows along the superstructure is unobstructed by fastenings and her side entrance doors discreetly recessed. 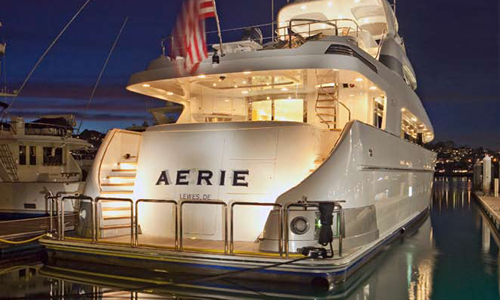 The luxury yacht AERIE incorporates the use of interesting angles and graceful curves. 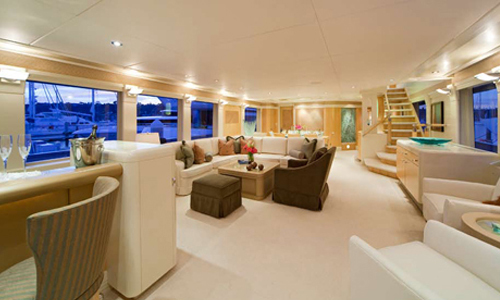 This distinguishes the yacht’s interior floor plan from many and her interior styling is graced by exquisite textures and textiles. Capable of cruising at relatively high speeds, the fast yet efficient performance of this yacht echoes the fluid flight of the eagle. 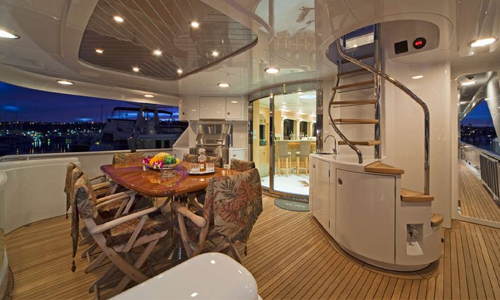 AERIE is able to accommodate up to 8 guests in 4 cabins in a 3 double and 1 convertible cabin format. The Main Salon has an L Shaped sofa. Large flat screen TV, a Wet bar with 4 stools and powder room. 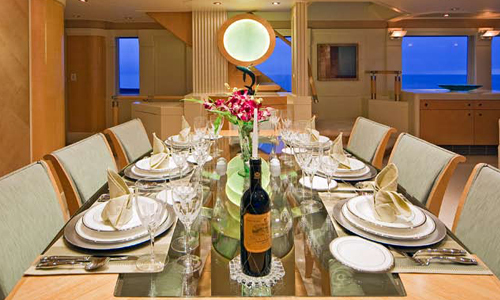 The yachts Dining area has a table that seats 8 guests. 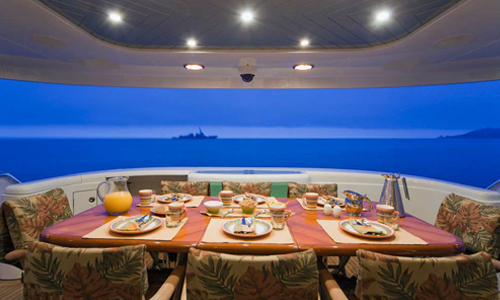 AERIE’s Aft Deck offers alfresco dining for 8 guests, a BBQ and a unique live fish tank. The Sky lounge which is full width of the beam has a Large screen TV, a Sofa and 2 comfy stress-less recliners with ottomans. 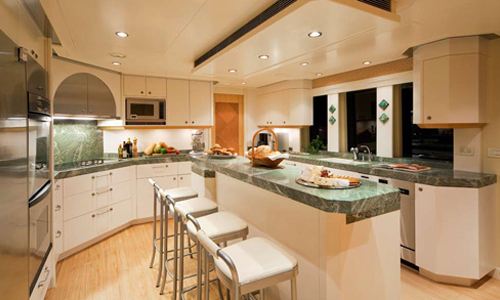 There is also a Game table with 4 chairs, a Wet bar, a refrigerator, and an ice maker. For those who want to work off the gourmet meals offered on board, there is an Exercise bike, exercise ball and hand weights. 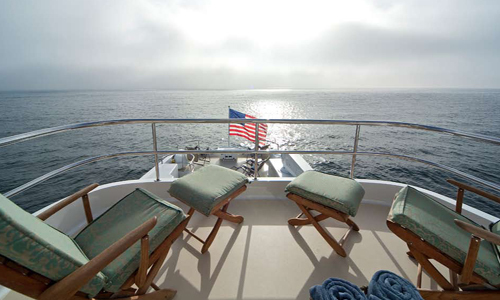 The yachts Boat deck features 2 lounge chairs to the aft and her Upper aft deck offers Al fresco dining for 8 guests, a BBQ, wet bar, refrigerator and an ice maker. 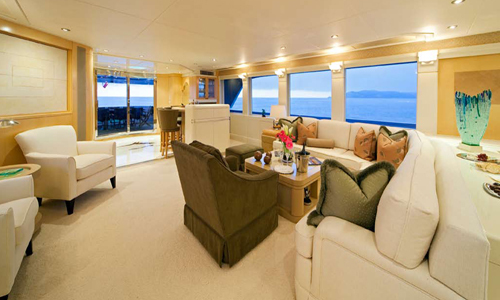 Luxury motor yacht AERIE can accommodate a total of 8 guests in 4 cabins, one of which is convertible. 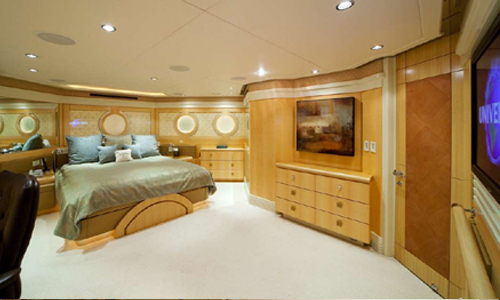 Her master cabin located below decks has a King bed, a desk and his and hers bathroom- hers with Spa Pool and TV, his with a large shower. 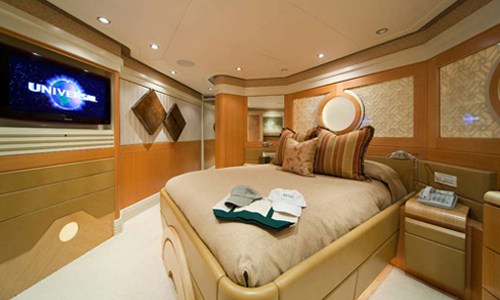 The VIP suite is located on the main deck and has a king bed that can convert to a twin, and ensuite shower with double sink vanity. 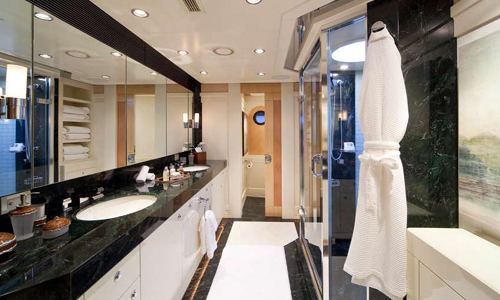 2 Queen staterooms each have a shower and all cabins have flat screen TV’s and AMX controls for Audio and Visual. As well as IPOD docking stations. 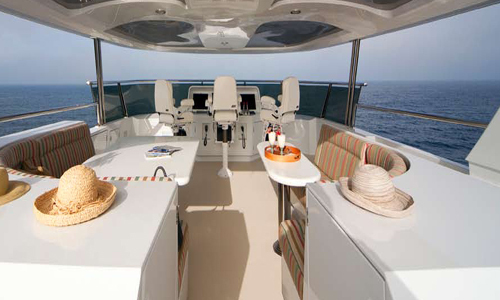 Luxury Yacht AERIE has the following tenders and toys: An 18' Nautica with 150hp Yamaha, a 10' RIB with a 9.9hp Yamaha, Snorkelling gear, water skis, a wakeboard and tubes, a 2-person kayak, a clear bottom kayak and a 2 man inflatable kayak. 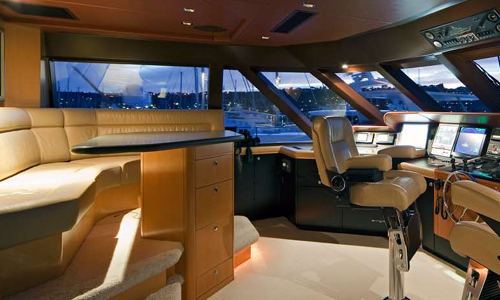 The yachts Communications include WIFI, two V7 VSAT VOIP, fleet 55, a Phone and Fax. 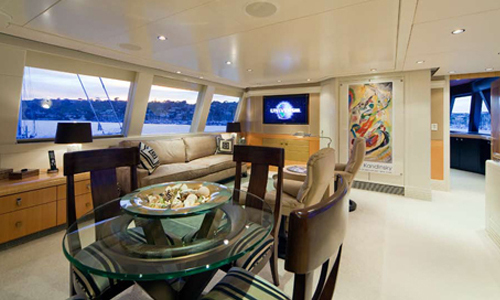 Her Audio Visual Equipment and Deck Facilities include IPOD docking stations, AMX controls for Audio and visual and flat screen TV's throughout the yacht.